I am very particular about my bananas. A memory is seared into my brain that sort of shaped my childhood banana preferences. On the bus ride home, a girl pulled out a completely green banana, slowly peeled it, and took a massive bite. To tell you the truth, I thought she was joking when she said it was the only way she ate bananas. I have seen recipes where there is a layer of Cream Cheese visible within the baked sweet bread. The secret, though, is this: When mixed into the batter, it produces a soft, moist bread that melts in your mouth whether warm or cooled! Beat butter and cream cheese at medium speed with an electric mixer, until creamy. Gradually add sugar, beating until light and fluffy. Add eggs, 1 at a time, beating just until blended after each addition. Combine flour, baking powder, baking soda, and salt. Gradually add to the butter mixture, beating at low speed just until blended. Stir in mashed bananas, vanilla, and pecans, if used. Spoon batter into 2 greased and floured 8×4″ loaf pans. Optional: Sprinkle a thin layer of sugar across the top of the batter. This will produce a sweet, crunchy crust that is simply delicious. Not too much, though, just a thin sprinkle. Bake at 325 degrees for 90 minutes, or until a toothpick inserted into the center comes out clean. The lower temperature with longer cook time will produce a moist, cooked through bread with just the right amount of browning. You can see that in two spot I got a little too liberal with the sprinkled sugar. It doesn’t change the flavor, it just doesn’t look as “pretty.” It’s up to you if you choose to sprinkle the sugar for that sweet, crunchy crust. Allow to cool in the pans on a wire rack for approximately 10-15 minutes before removing from the pans. Tip: Running a knife between the sides of the pan and the bread helps to dislodge the bread a bit quicker. If you’ve greased and floured the pan adequately, this is not necessary. Once removed from the pans, allow bread to cool completely before placing it in any sort of storing container or bag. Because I may have a slight addiction to chocolate, I’m going to put it out there that 8 ounces of mini semi-sweet chocolate chips is a sensational addition to this recipe! The secret is IN the bread-- Cream Cheese makes this sweet bread ultra moist, and delectably delicious. Our family's favorite banana bread recipe, hands down! Combine flour, baking powder, baking soda, and salt. Gradually add to butter mixture, beating at low speed just until blended. Stir in bananas, vanilla extract, and pecans, if used. **8 ounces of mini semi-sweet chocolate chips are also a great addition. Spoon batter into 2 greased and floured 8x4" loaf pans. *Optional: Sprinkle a thin layer of sugar over batter, to give it a sweet, crunchy crust. Bake at 325 degrees for 90 minutes, or until a toothpick inserted into the center comes out clean. Allow to cool on a wire rack for 10-15 minutes before removing from pans. Once removed, allow bread to cool completely before storing. What about you? How do you like your bananas? Do you add in a bit of chocolate? Let me know what you think of the Cream Cheese MIXED IN the batter, not just incorporated into the bread. If you’re like us, you’ll let your bananas get a bit brown, just to make this recipe! Enjoy! 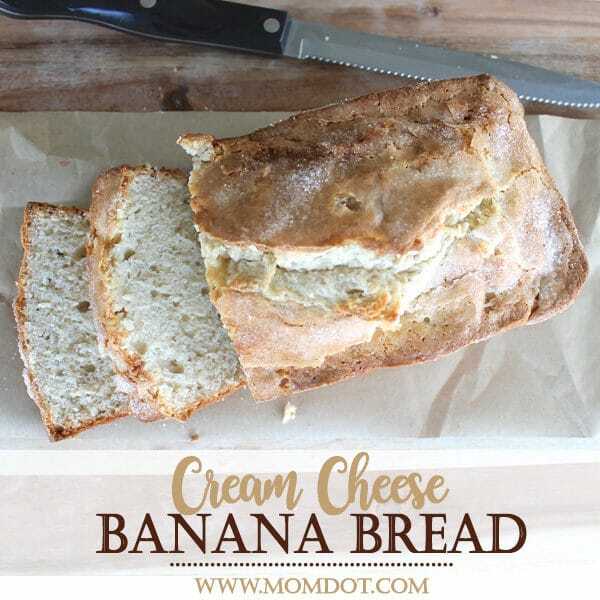 This isTHE BEST banana bread! Thank you for the recipe! I am so glad you love it as much as I do! Thanks for commenting! !